My problem started on the second scheduled files backup of the morning about ten minutes after a successful first scheduled backup of a different set of files. I understand that VSS should make it possible to interact with the system during these backups, but I have always avoided tempting fate, and made sure not to interact with my own system during this process. However, on this occasion, it may be that my wife interacted with her email files while the backup of those files was initiated - or that may have nothing to do with it. Failed: Failed to load 'N:\Backups-Macrium\From-Tiger\Tiger-Files (D&E&I)\F78312DE9999F7EF-119-119.mrbak' ReadFile - Access is denied. Note that this was only about 10 minutes AFTER the first scheduled backup successfully accessed those folders. Attempting to examine the relevant folders with Windows Explorer produced a standard meessage about not having permission to access the folder. Granting administrator access produced a further message about security permissions requiring modification. In the circumstances, I rebooted the system and was then able to open and examine the relevant folders and files, which all seemed to be ok. So I retried a manual backup from the UI, and it then hung after displaying just the Overall Progress bar at 0%, and with no other backup summary or progress text displayed. And this is what now continues to happen every time I try it. Additionally, I have resorted to using the Windows Task Manager to try to end the Macrium application/process, but this still seems to leave ReflectBin.exe listed as a running process, the consequences of which seem to be a significant degradation of peripheral (e.g. mouse) responsiveness, and difficulties getting the system to shutdown properly. This applies EVEN IF I start Macrium just to examine a log for example, even if I don't try to start a backup. It seems that whenever started, ReflectBin.exe feels it necessary to initiate an activity which it is unable to advance or complete. On V 7.0.2199, "Fix VSS problems"- made no difference. Uninstalling, reinstalling, and updating to V 7.1.3196 (CBT & Image Guardian declined for the time being) - made no difference. On V 7.1.3196, "Fix VSS problems"- made no difference. Creating a new test backup definition directed at a different folder - made no difference. Directing the new test backup at a different (removable) HDD - made no difference. Examining the Macrium's Windows Event Viewer - shows no Errors or Warnings for VSS events. Well, I have run out of ideas. I don't know if there are one or two problems here - the problem which initially caused the second backup to fail, and the problem which now stops Macrium starting more backups (what IS ReflectBin.exe getting stuck on?). At first, I thought it might be a problem with the target HDD or partition, but trying a removable HDD seems to have eliminated that explanation. At the moment, I am reluctant to try rolling back my system by trying to restore a previous Macrium image backup of my C-disk, at least, until I have a better understanding of what may have gone wrong. And rolling back my system always leaves me with a few more grey hairs ... (not that I have many left). Have you tried uninstalling and then reinstalling 3196 directly (you can get it by using the download agent) rather than reinstalling 7.0.2199 and then updating? Have you tried disabling or ideally uninstalling BitDefender, at least temporarily? I'll spare you my soapbox on third-party anti-virus solutions, but suffice it to say that especially these days, they can end up creating more problems than they solve, and there are many cases reported here involving third-party AV interfering with Reflect. Even if it's worked in the past, the fact that AV is constantly updating means problems can arise even when you seemingly haven't changed anything. 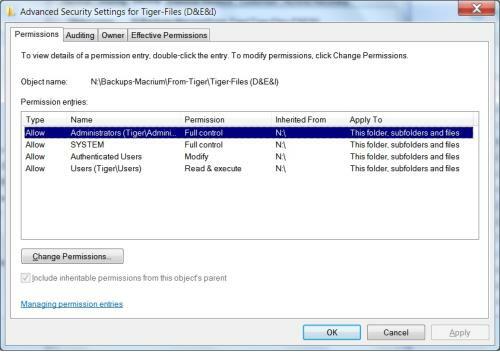 Was the requirement to change the security permissions on your original backup destination folder expected? The only reason you should have been unable to browse to that folder would be if you had deliberately configured more restrictive than default permissions on it. If you didn't do that, then I'm wondering if the altered permissions are symptomatic of some other issue, although the fact that you weren't able to run a backup even to a completely different target suggests that at the very least, that wouldn't be the only problem here. Also, can you confirm the OS you're running? There's no such thing as Windows 7 SP2; there was only an SP1 release, which is unfortunate considering how many updates have occurred since then. There was a "Convenience Update" that was released a while ago, but that wasn't a proper service pack. Lastly, as a general note, you may want to update Reflect more frequently. 7.0.2199 is almost a year old at this stage, and there have been several updates since then, including some that fix bugs that pertain to Rescue Media and/or restore scenarios. But now that you have updated, definitely remember to update your Rescue Media as well. I made several edits to my original post above to add some more ideas and questions, but I also wanted to confirm one additional detail since it's not entirely clear from your post. Did these problems arise while you were still on 7.0.2199 and then you updated to 3196 in the hopes that they might go away, or did you update to 3196 and immediately start encountering these issues? 7.0.2199 was actually the latest update available when I last did updates to this machine in September. I've had to delay MS Windows updates to this machine since then because of problems with a couple of legacy applications, and Macrium Reflect updates got bypassed in the process. IIRC, that was prior to the availability of Macrium Image Guardian. However, I have now overcome the legacy problems, and am ready to bring the machine up-to-date. I encountered the problems running on 7.0.2199 this morning. I updated at that time to 7.1.3196 to see if that would fix the problems. I have just tried uninstalling both Macrium and BitDefender and rebooting again, and then directly downloading and installing 7.1.3196 (without CBT or Image Guardian enabled), but I still get the same problems. What is curious is that I find from Windows Task Manager that ReflectBin.exe is not terminating even if I just enter and then exit Macrium - i.e. without even trying a backup - and then hanging shutdown in the process. Re your other questions. No, the requirement to change security permissions was not expected, but was consistent with the error message I found in the backup log. This was about ten minutes after a different Macrium backup finished successfully. It is unlikely that the "naive" user (not me) of the machine did anything significant in that time, since she still can't grasp how to use Windows Explorer (no criticism intended). My mistake re the OS. I meant SP1 not SP2. I've got Virtual XP SP/2 on my mind since that was the mechanism I was using to run the legacy applications mentioned above, but that's only ever been run three or four times on this machine and never concurrently with Macrium. I'm on UK time here, so I'll be resuming this activity tomorrow. I suppose it's possible that ReflectBin may be hanging while trying to access your backup folder since it would be in Reflect's "Folders to search" list. That's about the only way I can think to unify these two strange behaviors, which I'm trying to do because Occam's Razor doesn't want me to assume that two unrelated problems occurred simultaneously. That still doesn't explain why the permissions changed in the first place, but to continue troubleshooting, right-click the folder containing your images, go to Properties > Security > Advanced and post a screenshot of that window. The SYSTEM account should have Full Control, and that permission should be inherited from the root of the drive. If you don't see an entry like that, see if the checkbox to inherit permissions from parent folders is checked; if it isn't, check it and click Apply, then see if such a permissions entry appears. If so, try running backups again. If you still don't see such an entry, close out of there, right-click the hard drive itself, and go to its Security tab, then add an entry for the SYSTEM account and give it Full Control permissions, then recheck the permissions on your image folder. If you still have trouble, Macrium is also based in the UK, so hopefully they'll be able to get you sorted quickly. Best of luck! Nope, that's not it. Good idea though and I was hopeful. Unfortunately, the security settings seem to be exactly as you believe they should be. I've attached a screenshot of the Advanced Security Settings for the folder containing the file that Reflect first baulked on. I've also attached a screenshot of the containing and associated macrium folders and files. And I've checked the security settings of all the macrium folders and first half dozen macrium files shown on that screenshot. Thanks very much for your thoughts so far, J. I didn't realise Macrium was in the UK, though they may not see this thread straightaway since we have a public holiday today. Well, I seem to have overcome the problems and am back in business, but they have left a bit of a mystery in the process. but had nevertheless claimed to have completed successfully, with a "success" email notification (which is why I hadn't spotted it). 2. Then, a week's worth of incremental Files & Folder backups ran successfully. 3. Then, the next incremental Image backup failed to run at all - don't know why - maybe user error, or maybe something to do with the above. 5. ... and then an attempt to Robocopy my backup files to a backup server stalled 6% through trying to copy the -127.mrimg file noted above. Since Robocopy couldn't read the -127.mring file, I'm guessing that the Reflect hangups, the degraded peripheral performance, and the failures to shutdown were all due to the Reflect application and/or services getting fixated on that file. In any case, I deleted the file, rebooted and all the problems went away. I removed the now orphaned and associated incremental backups, verified the latest differentials, and have now recommenced my Reflect backups. I usually run my weekly backups as incrementals with a differential every month, and then thin out the older differentials, reducing the likelihood of consolidation being required. It's curious that, on this occasion, I had not run differentials for a few months, and so a 20-long incremental chain requiring consolidation had developed for both of the troubled backup sets. So what does WriteFile failed 1117 mean, and should Reflect have claimed "successful completion" of the backup in this case, preventing any email notification of the error? Curious to learn what that error code means now as well, but the reason it didn’t result in a failure is because the actual backup operation apparently completed successfully, even if the consolidation didn’t. I’ve seen consolidation errors myself when the person responsible for swapping destination disks at a client disconnected the disk while a consolidation was still running, and those logs still showed a success outcome — and at least in my case, Reflect sorted out the partial consolidation the next time it saw that particular disk in the rotation. There are even certain error codes related to the backup itself that can still result in a success outcome, such as (I think) errors about some VSS writers failing as long as a VSS snapshot can still be captured without using those writers. I’ve mentioned a few times in other threads that it might be nice to have a yellow “completed with warnings” outcome to draw attention to logs that might contain an issue that the user can take steps to address, but to date that hasn’t been implemented. This is a low level fatal error returned by the storage device.